The Tarantula Nebula is located in the southern constellation Dorado (Dolphin Fish), 160,000 light-years from Earth. Fred Herrmann of Huntsville, Ala. captured this image remotely from Siding Springs, Australia. It was released to SPACE.com on Dec. 1, 2013. 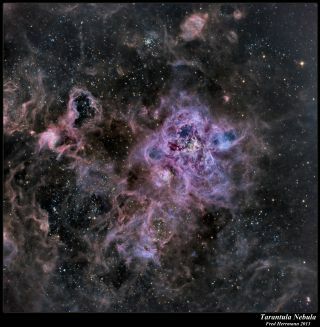 The bright core of the Tarantula Nebula is shrouded in shades of purple in this stunning image recently sent in to SPACE.com. Also known as 30 Doradus, or NGC 2070, the Tarantula Nebula is located in the southern constellation Dorado (Dolphin Fish), 160,000 light-years from Earth. A light-year is the distance light travels in one year, or about 6 trillion miles (10 trillion kilometers). "The Tarantula [Nebula] is so intensely bright it would cast a shadow at night were it 'only' 1,300 light-years distant as is the Great Nebula in Orion," Herrmann wrote SPACE.com in an email. "Some of the brightest and most massive stars known are located in the star cluster located at its core."